From Dynomighty Design. The new alternative to the standard old leather wallet. 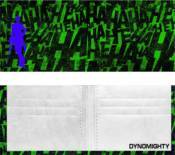 Make a positive step towards sustainable design with the Dynomighty Billfold. Utilizing a classic leather wallet configuration yet with the unique benefits of Tyvek to make a wallet that is thinner lighter and stronger than a regular leather wallet. The incredible durability of the material which is created by thousands of interlocking randomly spun fibers 50 times smaller than a human hair. Each Dynomighty Billfold has a large pocket for cash and many of the standard leather wallet compartments and storage areas (1 large pocket for cash & receipts and 6 credit card pockets). Engineered to be thinner, lighter and stronger than a standard leather wallet you can easily use any security door pass or electronic transit system without opening your wallet allowing you to stay on the go. The stitched construction is of the best quality ensuring you a long life of use with your Dynomighty Billfold. Each Dynomighty Billfold comes with its own elegant presentation box making it a great gift anytime of the year. Step up to the new alternative to leather and see why the Dynomighty Billfold is engineered to be thinner lighter and stronger for a better wallet, for a better you and for a better planet.